If you’ve been following the saga of 10 Tons shooters you’ll be quite familiar with the level of quality they bring to the table. There’s no mistaking it, they know how to make a quality twin-stick shooter. While the other 3 already available on the Switch have tended to change things up a bit by incorporating roguelike elements, mission-based play, and time-distortion mechanics now get ready for something decidedly more old school. 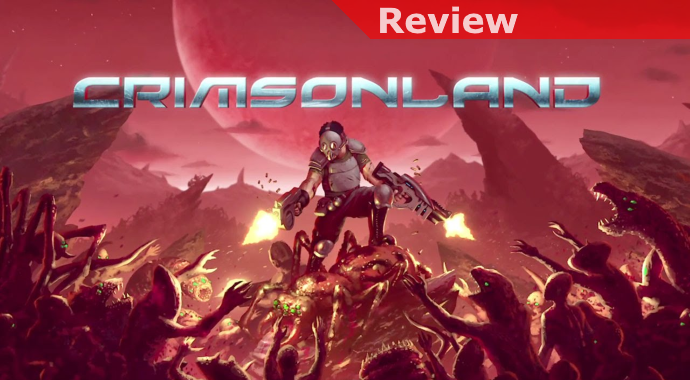 Eschewing the trappings of genre-blending and higher-minded play Crimsonland delivers an adrenaline shot of pure twin-stick shooting carnage… and it is glorious! To start things out you’ll want to work your way through the Quest Mode, which will allow you to unlock everything in the game and generally walk you through the various weapons and perks step by step. This is important because the game has a staggering number of both and you’ll want to know which ones best suit your style and will help you survive over the long haul. Guns with a lot of flash can be fun but elements like reload times and how they do their damage need to be taken into account. Similarly with perks you’ll only be given a few to choose from at a time and which ones you run with are vital to your survival. Once you’ve completed the the initial gauntlet of levels and have unlocked everything the game has to offer you can then get down to business properly in Survival Mode. The reason you’ll want to complete Quest mode first is that you can only use what you’ve unlocked there and some of the late perks and weapons are well worth your time. Though there are several flavors available my attention was generally drawn to the vanilla Survival and Blitz modes. To be complete Rush gives you only an Assault Rifle to try to survive with (Ha! ), Weapon Picker essentially gives you just one clip of ammo per weapon so you’ll need to quickly get to anything you can to stay alive, and Nukefism gives you no weapons at all, just an ability to run and hope to get to the next power-up to eke out a few more moments before your inevitable demise. Those are decent variants but the focus should generally be on Survival and Blitz. They’re generally the same but in Blitz things simply escalate far more quickly. Both are pure twin-stick shooting goodness though, challenging you to take what you’re given and to stay alive as long as you can. You’ll get a choice of perks every time you level up and you’ll want to get to know them well because the right combination will give you far more staying power, even if there’s no end aside from death. In terms of criticisms most of my issues arose in handheld mode and are a matter of scale and perhaps tastes. Some of the weapon icons at that size are hard to differentiate from one another but the bigger issue I had was with the aiming reticle that also gives you information on how much ammo you have left. I’d have loved an option to either minimize it or perhaps make it more transparent, in handheld mode when things got intense I often found it a bit too distracting. Aside from those small thoughts the game is just a monster at what it does though. 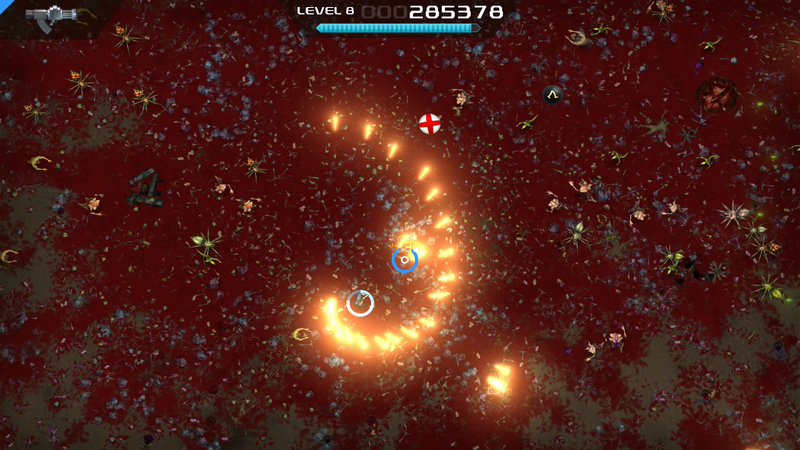 While it won’t win points for its complex and challenging story or trying to push boundaries Crimsonland is a thoroughly satisfying arcade-style twin-stick shooter that I will likely return to periodically for quite some time. While it isn’t graphically very impressive and the sound is relatively limited there’s no denying the power of its gameplay. It is adrenaline-fueled, brutally challenging, over-the-top, and should be considered a must-have for shooter fans! Great solo, even more insane with up to 3 friends!